I love the photos of this library. My first thought was of benches in the library. They are beautiful, but, I have a feeling it would be like the locker room in the gym. Someone would be sitting on the bench right where the book you need is shelved, just like people in the locker room sitting in front of the locker where you put your belongings. The original article is linked above. A lot of the comments went way off topic, so I didn’t include those. 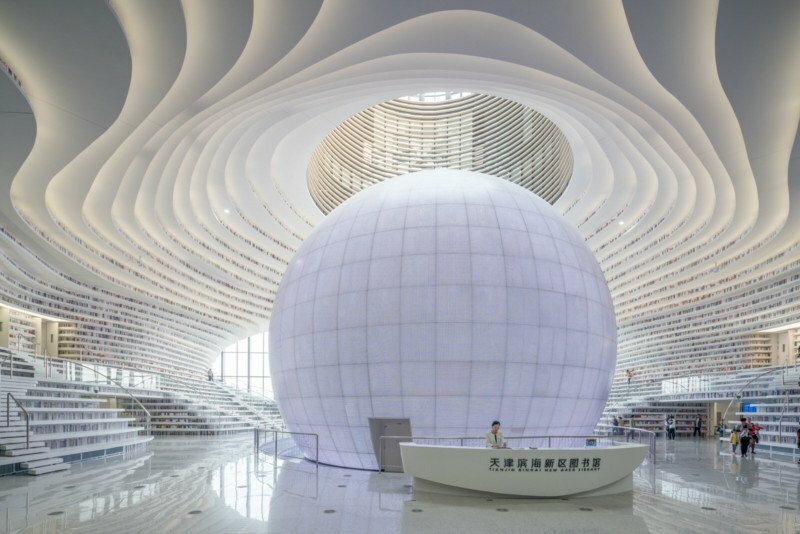 China recently opened a new futuristic library that contains a staggering 1.2 million books. If you enjoy architectural photography, Dutch photographer Ossip van Duivenbode‘s images of the library will be a feast for your eyes. The new Tianjin Binhai Library in Tianjin, China, was designed by the Dutch architectural firm MVRDV to look like a giant eye. The five-story, 360,000-square-foot library features shelves spanning from the floor to ceiling — many of the shelves double as stairs and seats in the beautifully designed space. The “books” above the actual bookshelves are actually painted onto the building to look like full shelves that continue up to the ceiling (creating the floor-to-ceiling illusion). The Tianjin Binhai Library was built in just 3 years and opened to the public on October 1st, 2017. I had Where’d You Go, Bernadette returned to the library, so I have to wait until I can get it back again. I am number 3 in line for the holds, so I hope it will go quickly. I am still working on Small Great Things on audiobook. It is getting better and better as I get further into it. I have started the Great Chocolate War, and I am supposed to be reading The Talented Mr. Ripley for bookclub. We’ll see how far I get this week. I haven’t been alone in my car for a couple of days, so I haven’t been working on my audiobook, Small Great Things. I might finish it by the end of the week, though. I am working on Where’d you go, Bernadette, but I think it’s going to have to go back to the library before I’m finished. I started Daisy Jones and the Six. It’s been put on the backburner for a bit so I can attempt to finish Bernadette. I especially loved the red cover section. I was awoken early this morning by my mom telling me that my dad had passed away. The hospice nurses warned us yesterday that it was coming soon. We contacted those who needed to know immediately. My aunt stepped in to help plan everything. It looks like plans are all in place. I left the house to complete two errands that I had already planned. One was to return library books, of course. I grabbed lunch while I was there. I feel bad that I left the house, but Mom wasn’t left alone. I needed to go do something productive. Everything else is already being taken care of. Thankfully, we have a lot of supportive friends and family nearby. It wouldn’t have been a trip to the library if I wasn’t on public transportation. The entertainment was a guy yelling that he was on the wrong train, then swearing at the doors until they opened at the next stop. He didn’t get off the train, though. Maybe he was on the right train all along.